Let’s pay Coach Sampson what he’s worth and get him to sign a similar buyout clause! Problem solved! No more schools come poaching him! He goes too hard on one and done guys without building a base of good players with them. Too hard to win a national championship with almost all freshmen. Duke and UNC usually have elite college 4 year players mixed in with the NBA talent 1 and done guys. Although with Duke they seem to be headed in the Kentucky direction right now. Duke’s issue this year was a lack of those good older players resulting in no bench. Won NC - 2, eliminated in championship game - 0, eliminated in final four - 0, eliminated in elite eight - 3, eliminated in sweet 16 - 2, eliminated in round of 32 - 1, eliminated in first round - 2, regular season conference championships - 1 (though to be fair, ACC is a better conference). The only thing Coach K has over Cal in that span is one more natty and Cal missed the tournament once while Coach K hasn’t. It’s a single elimination tournament and when you get top tier talent, it’s not like Bama football where you get them for at least three years. It’s hard to win nattys no matter where you are. How is he going to do with one and done ending? He did alright before one and done started in '06. That list, which simultaneously shows how hard and how random (Ollie) winning a championship is, should indicate how silly this hot take and message board fans who want Cal fired is. Once the whole appeal of “one and done” wears off since you can go pro from high school again, he will probably do better. I feel like more guys were going pro after 1 year than before because of that stupid phrase. Players who would normally do a 2nd or even 3rd year to raise their draft stock would rather get drafted 2nd round to be “one and done”. We will just have to see if coach Cal sticks to the “come here and I will get you ready for the NBA in one year” line that he has been selling guys. Sounds like Jamie Dixon is going to UCLA. That’s wild. I’m thinking his (Cal’s) salary alone in larger than our entire football staff . . . . .
He’s from So Cal area. Even though he’s Grad of TCU . His coaching tree started at sm colleges in Ca. area where he’s from. Do you think with the NBA’s G-league, the NBA will turn it a feeder system where players will just forego college and just go G-league? That is what the NBA is working towards and testing out with the higher dollar contracts for the G-League they will do for select players. We will see who, if any, get those this coming season. I think they only want the top recruits for that though, you wont see some #60 prospect getting that contract. So for top players they have to decide if it is worth the risk playing against grown men in a tough situation vs going to college (and getting paid that much under the table anyway). Darius Bazley decided to sit out instead of playing in the G-League because his people knew it could hurt his draft stock. In the long run, the G-League will be a true minor league for the NBA. They are just missing a couple teams so they can be have all 30 teams coverage with a direct affiliate. At that point, they should make the contracts go through the NBA team, currently G-League contracts go through the league and teams get the rights for players (other than two way players). There is so much money available, more of it needs to trickle down to the “development” league. 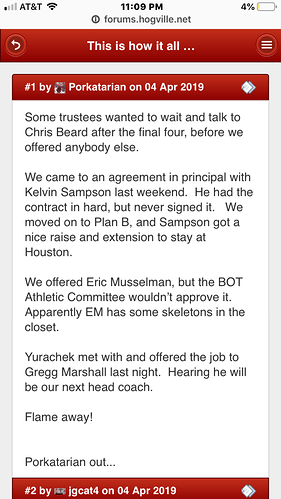 The buyout clause has and is becoming very significant-if I remember right the Texas Tech coach (Beard) signed his contract extension with Nevada? and a few days later accepted the Texas Tech job - similar to Todd Graham when he was at Rice and maybe even Tulsa as far as I know. Might not be a bad thing. For Duke, Kentucky, UNC, Kansas and a couple other programs that get the one-and-done kids, maybe. For the hundreds of other schools and thousands of other college basketball players, it will be the same or better. Lol, nah. They are very practiced at spinning things so as Arky ends up in a positive light. They make HY sound like Jeff Luhnow. Like all insiderish information. There’s probably some truth to it then quite a bit of spin. For all the talk of people saying CKS and his agent had 0 contact with the hogs. I don’t buy it, I think it was there and if we didn’t give CKS exactly what he wanted he easily could’ve left. But now it doesn’t matter because we got to keep CKS. In all businesses, 0 offers means 0 leverage. CKS doesn’t get HCIW, budget parity, etc; without a stick to go with carrot. Arkansas was his stick.